Your list of things to see and do now includes Kamppi Chapel of Silence, Sea Fortress Suomenlinna, Helsinki Cathedral, and other attractions. Satisfy your inner culture vulture at Seurasaari Island and Open-Air Museum and Taidekoti Kirpila. You'll discover tucked-away gems like King's Road and TeeMaa Tea House. There's much more to do: wander the streets of Ullanlinna, have fun at Murulandia, get the lay of the land with Walking tours, and make a splash at The Swimming Stadium. For photos, ratings, maps, and more tourist information, read Helsinki trip planner . If you are flying in from Austria, the closest major airport is Helsinki Vantaa Airport. In February, daytime highs in Helsinki are 0°C, while nighttime lows are -3°C. Finish up your sightseeing early on the 11th (Mon) so you can catch the train to Tampere. Kick off your visit on the 11th (Mon): examine the collection at Tampere City Library, Metso, take in the architecture and atmosphere at Finlayson Church, examine the collection at The Finnish Labour Museum Werstas, then enjoy the sand and surf at Rauhaniemi Beach, and finally examine the collection at The Car Museum of Vehoniemi (Vehoniemen automuseo). On the 12th (Tue), you'll have a packed day of sightseeing: take in the architecture and atmosphere at Church of St. Alexander Nevsky and St. Nicholas, see the interesting displays at Tampere Mineral Museum, examine the collection at Mediamuseo Rupriikki, then relax and rejuvenate at some of the top local wellness centers, then examine the collection at National Police Museum, and finally view the masterpieces at Galleria Ronga. For traveler tips, other places to visit, reviews, and tourist information, you can read our Tampere trip itinerary planning website . You can take a train from Helsinki to Tampere in 2 hours. Alternatively, you can drive; or fly. Expect a bit cooler evenings in Tampere when traveling from Helsinki in February, with lows around -7°C. Finish your sightseeing early on the 13th (Wed) to allow enough time to take a train to Turku. Kick off your visit on the 13th (Wed): kick back and relax at Ispoinen Beach and Sauna, then tour the pleasant surroundings at The Archipelago Trail, then examine the collection at Louhisaari Manor, and finally have fun at Adventure Park. 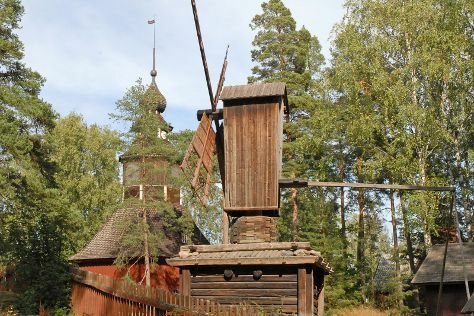 To find ratings, photos, where to stay, and more tourist information, read Turku day trip planner . Traveling by train from Tampere to Turku takes 2 hours. Alternatively, you can drive; or do a combination of train and flight. In February in Turku, expect temperatures between 0°C during the day and -5°C at night. Wrap up your sightseeing by early afternoon on the 14th (Thu) to allow time for the car ride back home.